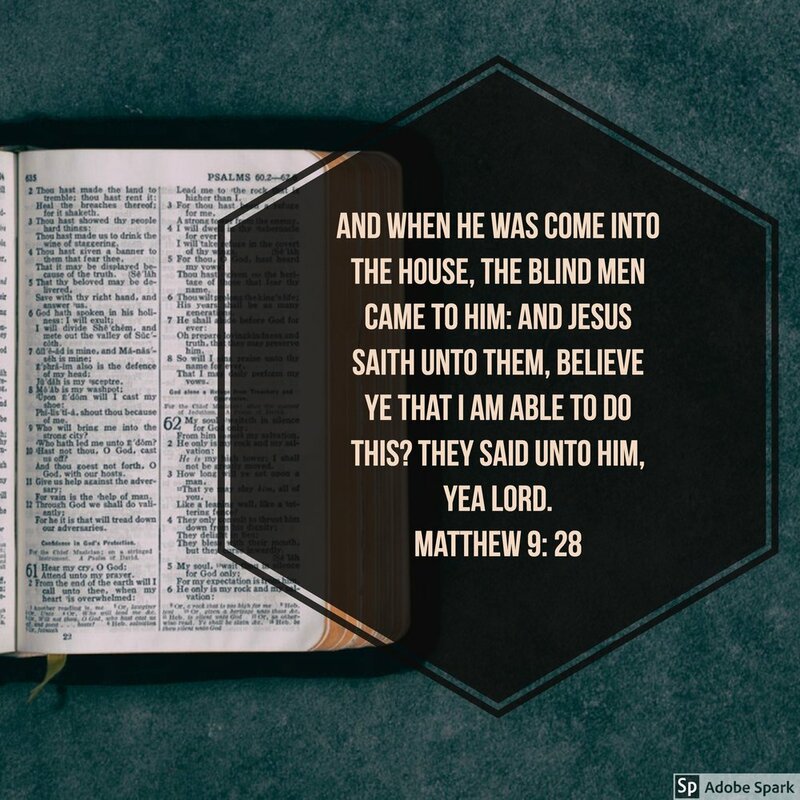 Matthew 9: 28 And when he was come into the house, the blind men came to him: and Jesus saith unto them, Believe ye that I am able to do this? They said unto him, Yea Lord. Believing God sometimes becomes a perfunctory academic experience. We will say, “Yes, I believe God can.” The truth is that we believe the semantics of what he says. We believe the theology of what He says. We believe historically what He says. We even believe the logistics of what He says. These men had heard of Jesus. They had heard of his ability to heal. They knew his person, position, and power. Yet when Jesus confronted them with the all-telling question, “Believe ye that I am able to do this?” They had to answer not based on what they had heard, knew, or felt. They had to give an answer from the heart. He questioned their personal faith. This was not what He had done for others but what He could do for them. They had to determine that they believed for themselves. Not the faith of their community. Not the faith of their family. They had to answer based on their faith. He questioned their practical faith. This is their blindness. They could not see. They had faith to follow but now needed faith to believe they would see. They knew blindness. They knew darkness. Yet if they believed He was able to do what none other could do, they would see. He questioned their philosophical faith. They had to take the testimony of their friends and family about this one called Jesus. They had to believe in someone they could not see. They had to take a “blind step” of faith. This challenged their known existence. What about you? Do you believe God can take this dark situation in which you are surrounded and bring you to light? Do you believe God is able to do for you what He has done for others held hostage by this same problem? May I repeat the Lord’s question? “Believe ye that I am able to do this?” God’s ability is never in question; it is generally our faith that comes into question.